Aaron Copland (1900-1990) is generally considered the most popular and well-known composer of American art music, and yet little scholarly attention has been paid to Copland since the 1950s. This volume begins with a portrait of the composer and an evaluation of significant research trends which is intended to fill a void and to suggest directions for further research. 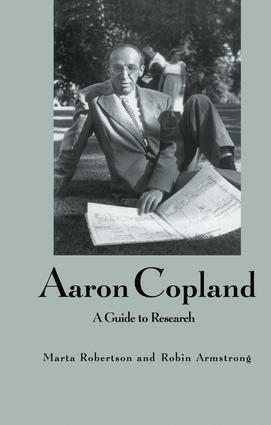 The guide also provides a section discussing Copland's interdisciplinary interests, such as ballet and film work, as well as a comprehensive bibliography of writings about Copland and his music. Marta Robertson is an assistant professor of musicology/ethnomusicology at Gettysbury College (Pennsylvania). She lives in Gettysburg, PA. Robin Armstrong is Assistant Professor of Music at Western Maryland College. She lives in Westminster, MD.